Bench watching TV at home with sons Bobby, Justin and Josh. Bench chatting with MLB Network host Fran Charles after the 'BENCH' premiere at Great American Ball Park Jan. 23. Bench also provides a running commentary, which I wrote about last week. You'll also hear remarks by Pete Rose; Tony Perez; former Reds broadcaster Al Michaels; former players Steve Blass and Reggie Jackson; singer Toby Keith; retired Indiana basketball coach Bobby Knight; and announcer Brent Musburger. 1. To see Bench enjoying fatherhood at 71, as narrator Martin Sheen, a Dayton, Oh., native, describes the Hall of Fame catcher this way: "It's not where Johnny expected to be at this point in his life." 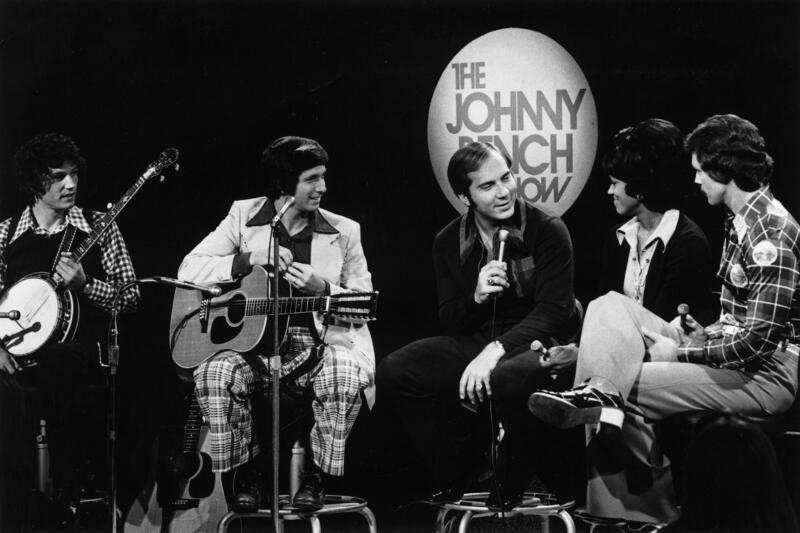 'The Johnny Bench Show' was syndicated by WLWT-TV in 1971. 2. To see a photo of The Johnny Bench Show syndicated by WLWT-TV, with Michaels or Bill Myers as announcer. His first guests were Bob Hope and Willie Mays. 3. For the nostalgia of watching hundreds of fans walking over the pedestrian ramp over Fort Washington Way from Downtown to Riverfront Stadium. 4. To see rare color home movies of playing ball as a kid in tiny Binger, Okla., which folks at the Reds Hall of Fame and Museum had not seen before. 5. To relive the Fountain Square celebration after the 1975 World Series, with Commissioner Bowie Kuhn presenting the trophy to Reds President Bob Howsam. Bench looking over scrapbooks in his home office. 6. 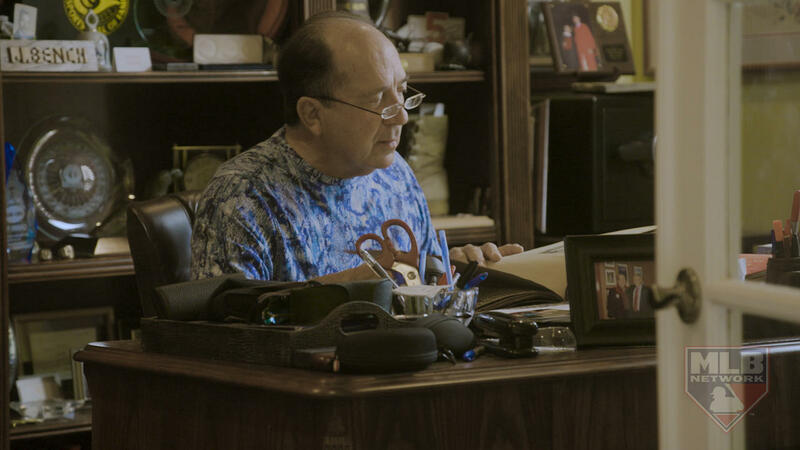 To see Bench in his office reading scrapbooks sent to him by fans, which his son Bobby found in Bench's storage garage. "I look back and say: Did I really do this stuff? I guess I did!" His offices walls are filled with framed memorabilia, including a Cincinnati Enquirer cartoon by Pulitzer Prize-winner Jim Borgman. 7. To hear Bench's impression of legendary baseball announcer Harry Caray. Holy cow! 8. To watch Bench explain that he innovated the catching position by catching one-handed after he had broken the thumb on his right throwing hand too many times. He also lists his four goals every time he took the field: Call a good game, throw runners out, block home plate, and get some hits. 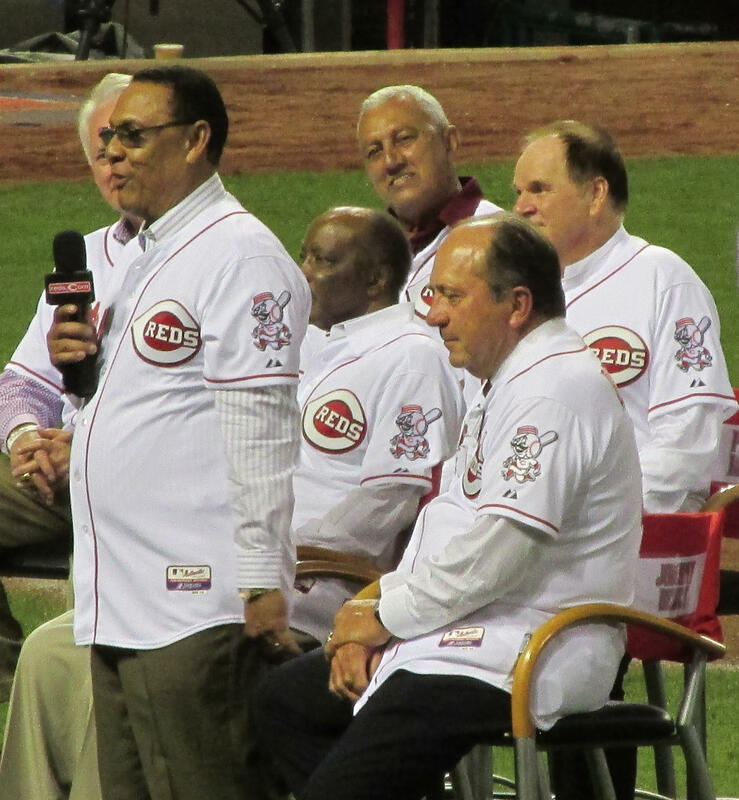 Big Red Machine reunion for Tony Perez Night on Aug. 15, 2015, with (from left) Perez, Joe Morgan, David Concepcion, Johnny Bench and Pete Rose. 10. For an explanation by Bench and Rose on what made the Big Red Machine run so smooth despite being "a team with alpha dogs," as Al Michaels says. "We had white leadership (Bench and Rose), we had black leadership (Joe Morgan), and we had Latino leadership (Tony Perez)," Bench says. Rose put it this way: "No team ever had a white Hall of Famer, a black Hall of Famer, a Latino Hall of Famer, and a Hall of Fame manager (Sparky Anderson). 11. To see Bench style the hair of his sons Justin and Josh in their Florida home. Cameras show him waking up the boys, cooking their breakfast and driving them to school. He told reporters last week that the best times are talking to them about school in the car. Bench also seemed disappointed that MLB Network didn't use footage of him doing laundry or going grocery shopping! 12. For a video clip of Bench singing "When You're Hot, You're Hot" on Hee Haw. He also talks about hanging out in Nashville with Willie Nelson, Charlie Pride and Glen Campbell, and dining at Frank Sinatra's Palm Springs home with Gregory Peck. 13. To catch glimpses of Reds equipment manager Bernie Stowe and hitting coach Ted Kluszewski briefly in archive video from the Reds clubhouse. Johnny Bench on Sports Illustrated cover Nov. 1, 1976, after winning Most Valuable Player award for the 1976 World Series. 14. To hear Al Michaels and Rose describe the differences between Rose and Bench. And to hear Pete gush about Bench: "He was the best catcher ever. I've been saying that my whole life." Rose calls Bench "a Gold Glove behind the plate with the ability to hit 40 home runs." 15. To see that famous photo of Bench holding seven baseballs in his huge hand. 16. To hear Bobby Knight describe his friend Bench: "A lot of guys want to play. Johnny didn't want to play. He wanted to win." He also said Bench was "smart and tough," the best combination for an athlete. 17. To see Bench's TV commercial for Gillette Platinum Plus razor blades and Kylon spray paint. No runs, no drips, no errors. 18. To see a brief clip of Bench on David Letterman's old NBC Late Night show (but you don't see Letterman). 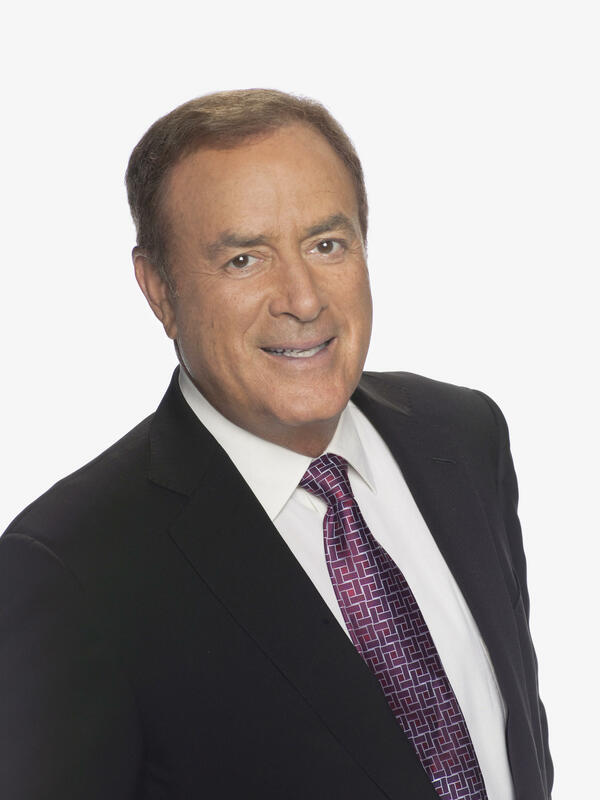 Al Michaels was the Reds radio voice 1971-73. 19. 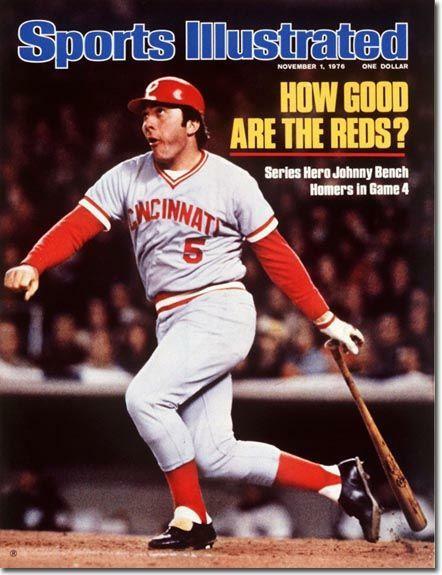 To hear Al Michaels' call Bench's ninth inning home run at Riverfront Stadium to tie the 1972 National League Championship Series against the Pirates on Oct. 11, 1972: "Johnny Bench, who hits most home runs to left, homers to right and the game is tied!" A few batters later, Michaels call the game-winning run when Pirates pitcher Bob Moose uncorked a wild pitch with pinch-runner George Foster on third: "In the dirt! It's a wild pitch! Here comes Foster! The Reds win the pennant!" Michaels says he was so excited his voice "hit like three octaves." 20. To see Bench on CBS' Mission: Impossible, in a Feb. 6, 1971, episode called "The Catafalque." Bench played "The Captain of the Guards." But you don't see Bench on the Partridge Family as a Kings Island Inn waiter from 1972. 21. To see photos of Bench on Bob Hope's USO Christmas Tour to entertain U.S. troops in Vietnam in December 1970, after his MVP season led the Reds to the World Series against the Baltimore Orioles. 21. To watch video from January 1989, when Bench gets the call to Cooperstown from Jack Lang, president of the Baseball Writers Association of America. 23. Seeing an a CBS Evening News with Dan Rather clip a few months later in 1989 about Pete Rose being investigated for gambling. 24. To hear a very proud Johnny Bench talking about his dad meeting Ted Williams, Pee Wee Reese and other Hall of Famers before his induction in Cooperstown. 25. To see the sheer joy on Bench's face as he watches TV with his sons. He messes with their hair, and they point out that he's bald. Sheen sums up the film by saying: "Arguably the greatest catcher who ever lived just goes by Dad." 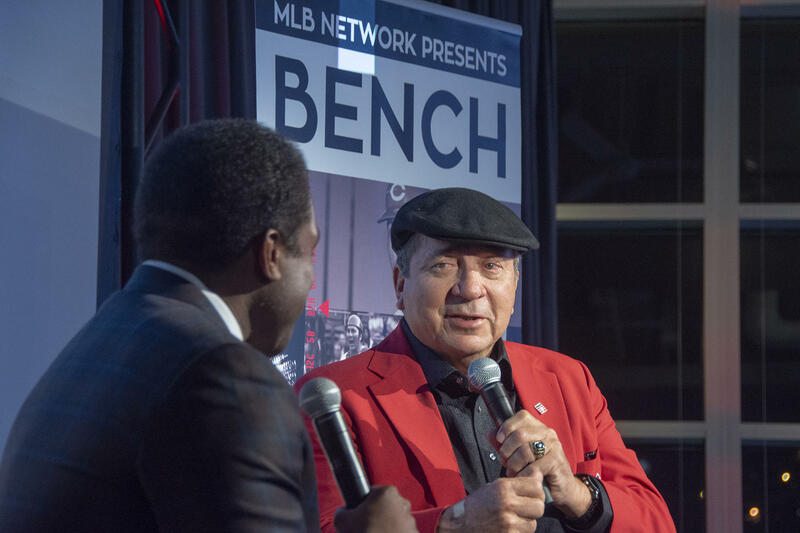 Johnny Bench, the charismatic and beloved Hall of Fame Reds catcher, returned to Cincinnati for the premiere of MLB Network's BENCH documentary with a comment about almost everything, as usual. The only thing that left him nearly speechless was watching the two-hour preview with friends and fans at Great American Ball Park. BENCH premieres 8 p.m. Wednesday Jan. 30 on MLB Network. Former High School Musical star Zac Efron won rave reviews for the Sundance premiere of Extremely Wicked, Shockingly Evil and Vile — but critics weren't that impressed with the film about serial killer Ted Bundy shot mostly in Northern Kentucky a year ago. "It’s a star vehicle that starts and ends with its star, the film around him struggling to justify its existence. Efron is wicked, the film less so," says Benjamin Lee for The Guardian, who gave the film three of five stars.